Can you believe it, I made my first infographic. I’m so proud. Just a few very easy, simple and free tips for you gardeners out there. The first one I tried recently and literally saved 4 plants that I was sure were goners. Amazing! ← Indie Spotlight – Tara L. Ames – How much heat do you like in your romance? I’m proud of you too. My mom used to do the coffee grounds thing. But she never made an Infograph!! I’m going to try the garlic clove. Thanx!! LOL, thanks Elva – you’re a pal. I will swear by that garlic water trick. I wish I had before and after pics the change was so remarkable. Let me know how it works for your plant(s). 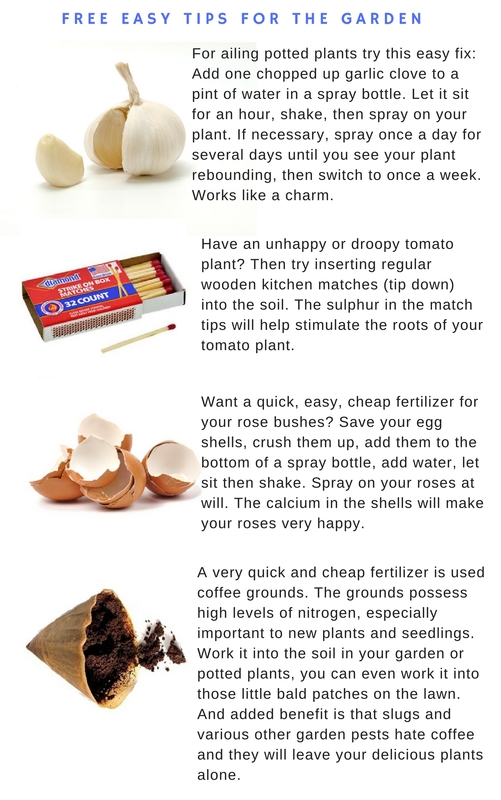 Great tips (and nicely presented) … if only I hadn’t given up gardening years ago. These days it’s more like constantly having to find someone to troubleshoot the sprinkler system, someone else to mow the grass, and yet another person to keep the weeds out of the rock mulch. I understand – lawns can be a problem, which is why I don’t own a house. lol. wish I had some home remedies for weeds – the only thing that I’ve tried that works okay is spraying them with baking soda water, or vinegar water – dries them right out. But you still have to pull their carcasses. Plus if you happen to hit the good plants they will become collateral damage too. LOL, it’s always something.